Approved by the US Postal System, transit sacs can be sent through the mail or used for inter-office mail. 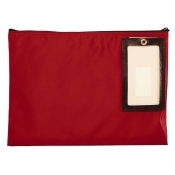 Contents are kept confidential by looping security seal through grommet and zipper pull. I.D. window and address card route sac. Ideal for flat materials like mail, reports, file, memos, publications and more. Maximum order: 10. Our in stock bags ship in 24 hours*. Need More Options? Click here...Made to Order Transit Sacs!